From Darth Vader to Kylo Ren to Boba Fett, what makes a Star Wars villain? Insider asks a panel of experts what the key ingredients of a Star Wars bad guy are! Plus: The making of the stunning Naboo Royal starship from The Phantom Menace. 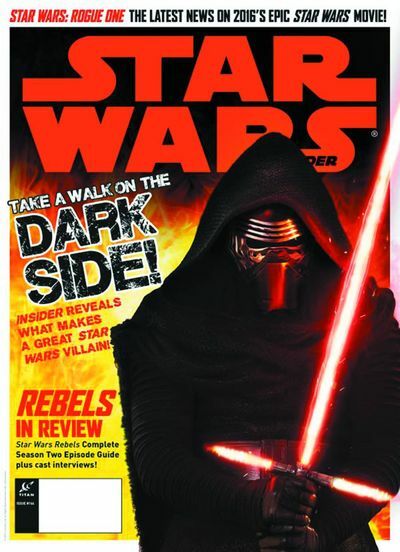 Plus, Alan Dean Foster discusses his novelization of Star Wars: The Force Awakens, and an all-new exclusive fiction! Available in Newsstand and PREVIEWS Exclusive editions. Legal Notice: Entire contents trademarked (® or TM) and copyrighted (©) 1986-2019 by Things From Another World, Inc. and respective copyright and trademark holders. All rights reserved. Page rendered at 2019-04-25 01:35:28 in 0.745 seconds.